Dhanush's second film in Hindi, Shamitabh is releasing all over the world today February 6th, and the film opened with premiere shows yesterday in select countries. Early reviews have been good and this is what the legendary Amitabh Bachchan had to say about the film, after its first public screening. Back from the first trial public show of #Shamitabh .. the applause at Interval and twice at end of film says it all .. !! Meanwhile in Tamil Nadu, Shamitabh is expected to be screened all over with English subtitles to maximize the reach and impact among the TN masses. The same happened with Aamir Khan's all-time blockbuster PK as well, and the film is still running in the state, stepping into its 50th day today. 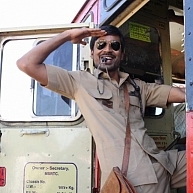 Dhanush Is All Set To Rock Bollywood Again With Shamitabh! People looking for online information on Amitabh Bachchan, Dhanush, Shamitabh, Shamitabh English subtitles will find this news story useful.